Note: as of September, 2011, the Sportbrain website is not responding. Check sportbrain.com before buying a unit as you will not be able to enjoy its features if the website is not active. If you own a SportBrain pedometer, check their site to see if they have resumed business. The X and X1 models could still be used to count steps, etc. but you won't have the website features for saving and reviewing your data. Fitbit: Fitbit has both models you can wear on your waistband and on your wrist. They have can transmit your data to a computer via a USB receiver or to a mobile app via Bluetooth. Computer-Linked Pedometers: More options for pedometers that will link with your computer. What was the SportBrain iStep Pedometer? The iStep X only displays the step count, to access the other stats requires an internet connection to the SportBrain.com website. Its successors, the X1 and X2 display distance, calories, etc. on the unit as well as uploading to see graphs and charts. The original Sportbrain had no step display, you had to wait until you uploaded it to the website to see what your step total was for the day. The SportBrain iStep X has a large step display, which you manually reset when you desire. But inside the SportBrain is tracking your steps over time and is always ready to upload to the SportBrain website so you can view your stats and graphs. 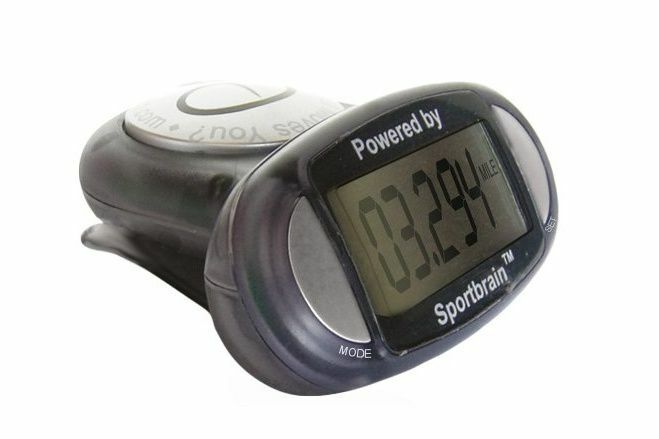 Size: The SportBrain iStep X is larger than most pedometers, 2 1/2 inches wide and 2 inches tall. That makes it a bit bulkier to wear, but for its features, I'll tolerate the bulk. It clips to your waistband with a plastic clip - and many users have reported the clip breaking, although they also report the company replaces the entire unit swiftly if that happens. The iStep X comes with a safety cord but no clip - I guess you are supposed to provide your own safety pin. That seemed odd, so I stole the safety cord from another pedometer. Noise: The iStep X clicks with each step. I do not find that annoying, it is not very loud. Accuracy: Testing against a standard pedometer and on a known course, I found it to be quite accurate. Previous to the website going inactive, these were the features you could use to save and track your data. The SportBrain iStep X comes with a USB cord. On first use, you download a program from the SportBrain website, register your SportBrain, and set a few basic bits of information about yourself. Weight and height are needed to calculate your calories burned and your BMI. The set-up was simple with no hitches. You can upload your data as often as you wish. You should upload at least once every 50,000 steps or every 5-10 days or some data may be lost. The USB cable makes it easy for you to travel with your iStep and upload from an internet-connected computer that has a USB port. However, it must be a computer you can download the SportBrain program into from the website. This is also convenient for using at both work and at home if you just can't wait to upload. Your steps for the past two days are displayed, with a heart indicating how close you came to logging 10,000 steps a day. It also estimates your miles and calories and compares your achievements to those of other SportBrain users in your age group. You can export your steps to an Excel spreadsheet if you wish. Your My SportBrain homepage also shows a bar graph of your steps for the past 7 days, compared with your age/gender group. Your Body Mass Index (BMI) is also displayed. Whenever you walk or run for 10 minutes or more, the SportBrain tracks that as a Sportivity and graphs your speed and distance and tells you calories burned and minutes. This was the feature that really sold me on the SportBrain - I love seeing my walking episodes graphed out with estimated speed and distance. You can add notes to each episode, noting location or weather or what shoes you were wearing - anything that strikes your fancy. Still not enough data? Next we look at the "Sportfolio" page packed with even more information from your walking steps. After uploading your SportBrain data, click to the SportFolio to explore it in many ways and to track additional information. You can view each Sportivity of the day, as well a past days, or view your walking steps over the course of a whole day. The SportFolio displays all walking episodes of 10 minutes or more as a Sportivity, giving time and estimated speed, distance and calories burne for each. You can add a note to each one. You can view each one separately. The total for the day is displayed with steps, total distance, running distance, calories burned (plus how many cheeseburgers and bananas you burned) and percent of your goal. You can add your weight and resting heart rate. Selecting "More Stats," there is a form to enter weight, blood pressure, resting heart rate, cholesterol, body fat, BMI, blood sugar, body temperature, mood, exertion, body measurements. You can enter food intake including total calories, fruit and vegetable portions, fat, sodium, carbohydrates, cholesterol, fiber, protein, water, alcohol, caffeine and cigarettes. You can select any of these to be displayed on your SportFolio page so you can easily track it daily. From the first time I uploaded my data, the SportBrain iStep gave me incentive to get out and log more steps. For the first time in months I am ensuring that I get at least 8,000 steps a day besides my long training walks on the weekends. The SportBrain was a great motivator. There are now many fitness monitors on the market that replace what SportBrain provided.